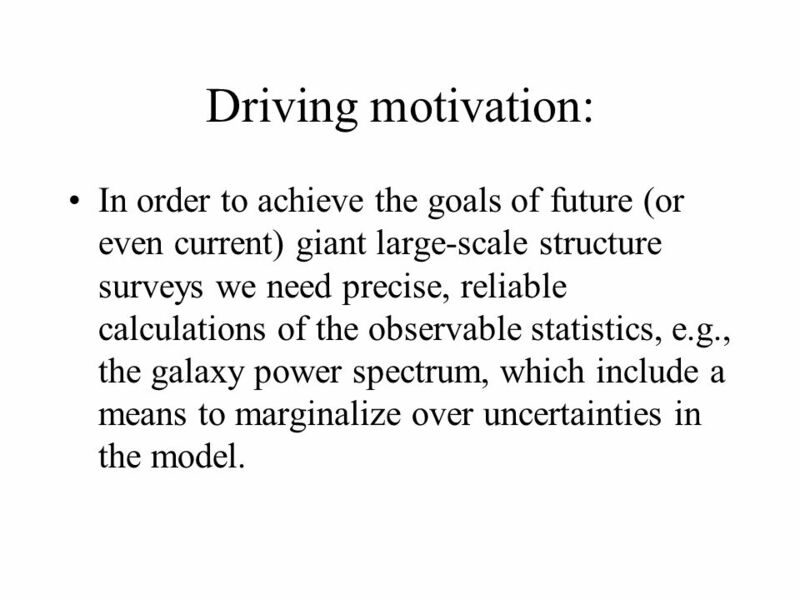 2 Driving motivation: In order to achieve the goals of future (or even current) giant large-scale structure surveys we need precise, reliable calculations of the observable statistics, e.g., the galaxy power spectrum, which include a means to marginalize over uncertainties in the model. 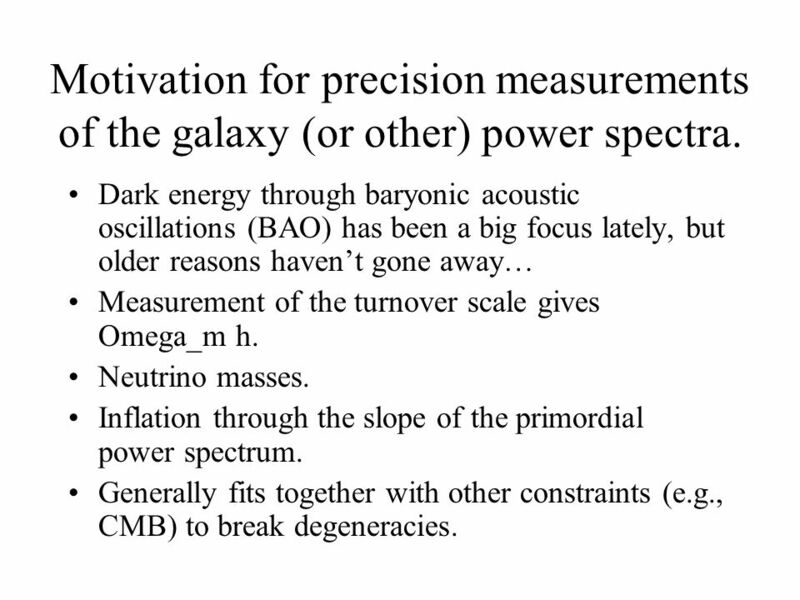 3 Motivation for precision measurements of the galaxy (or other) power spectra. 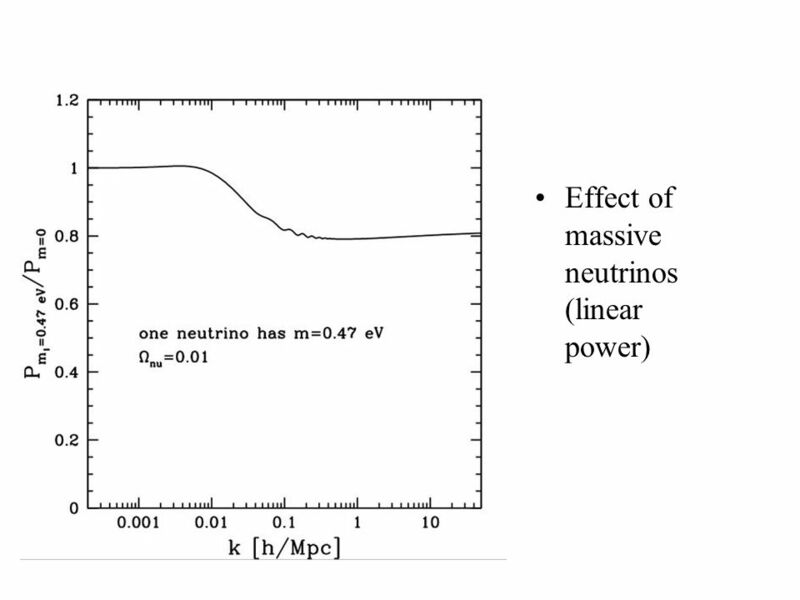 Dark energy through baryonic acoustic oscillations (BAO) has been a big focus lately, but older reasons haven’t gone away… Measurement of the turnover scale gives Omega_m h. Neutrino masses. Inflation through the slope of the primordial power spectrum. Generally fits together with other constraints (e.g., CMB) to break degeneracies. 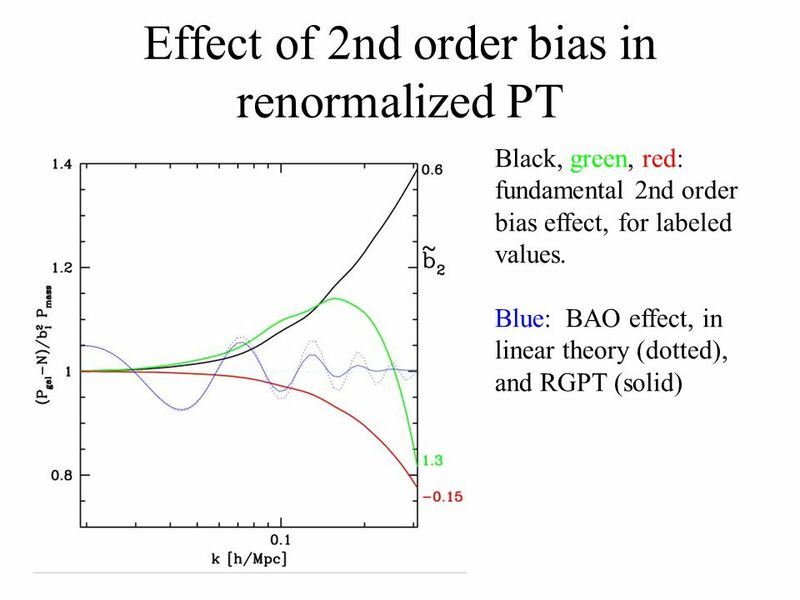 (Galaxy) bias in perturbation theory (PT). Renormalization group recovery of stream crossing (velocity dispersion) in Eulerian PT. 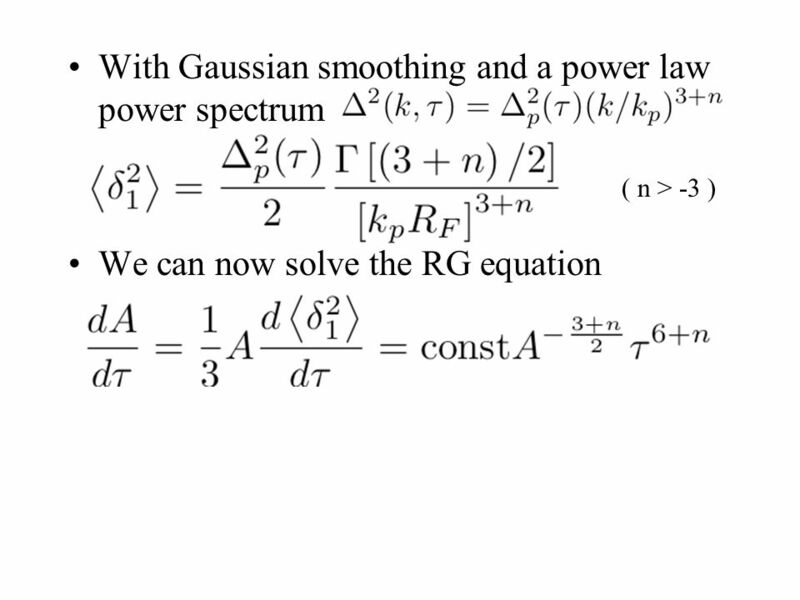 Renormalization group improvement of PT calculation of the mass power spectrum. 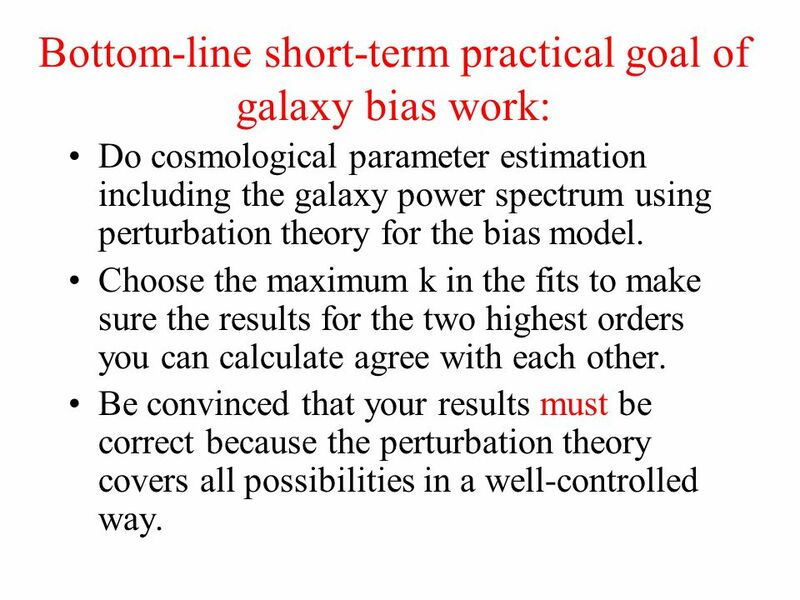 8 Conclusions Perturbation theory can provide a practical, elegant, immediately applicable model for galaxy bias (or other tracers of LSS). 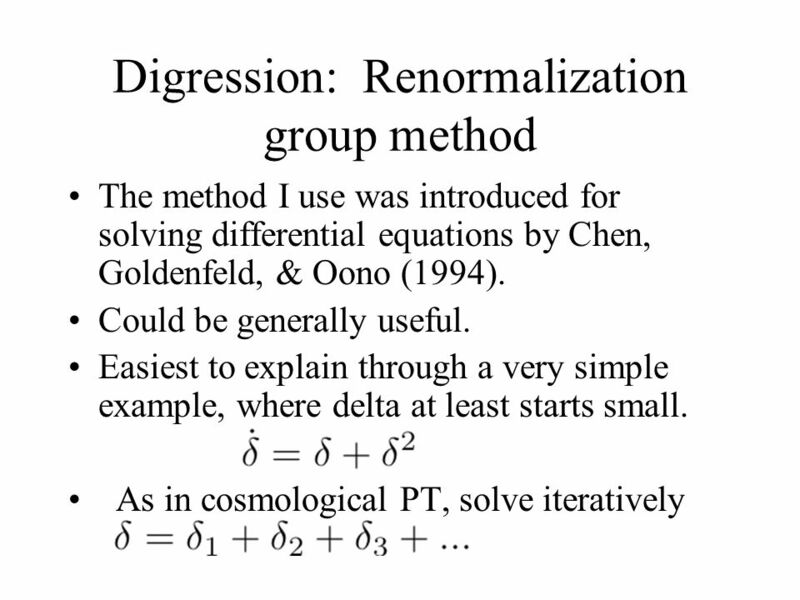 (McDonald 2006) The “single-stream” approximation in Eulerian PT can be eliminated using renormalization group method. 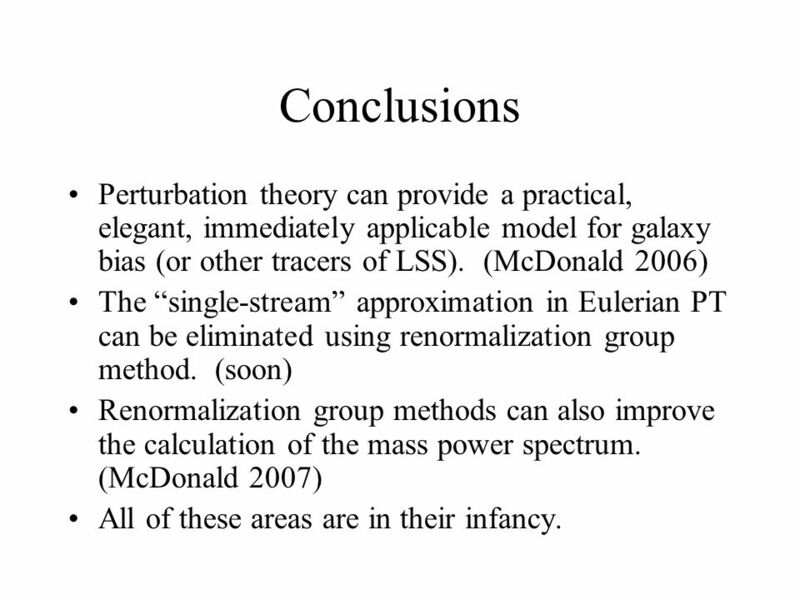 (soon) Renormalization group methods can also improve the calculation of the mass power spectrum. (McDonald 2007) All of these areas are in their infancy. Cole et al. 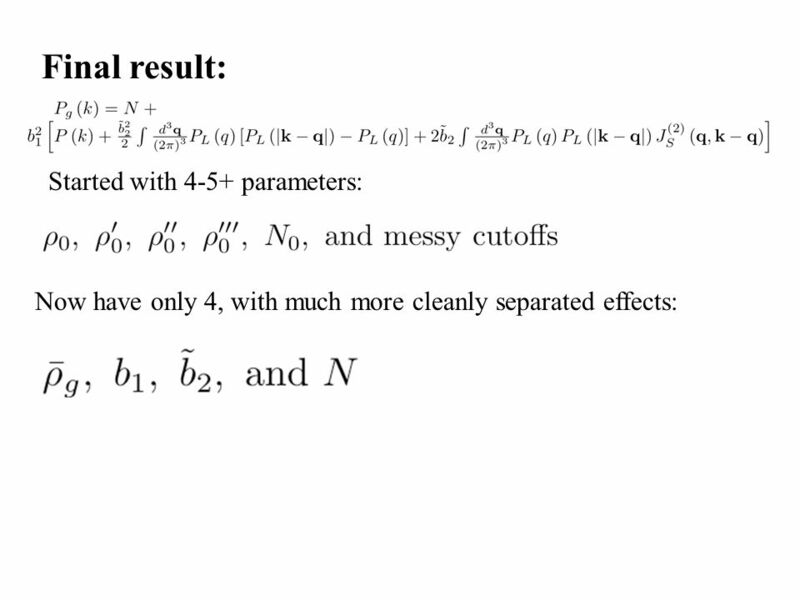 (2005) A=1.7, Q=9.6 (real space) A=1.4, Q=4.0 (redshift space) from semi-analytic models. Not clear how general, often marginalize over Q but not A Supposed to account for both non-linearities in mass power and non-linear bias. 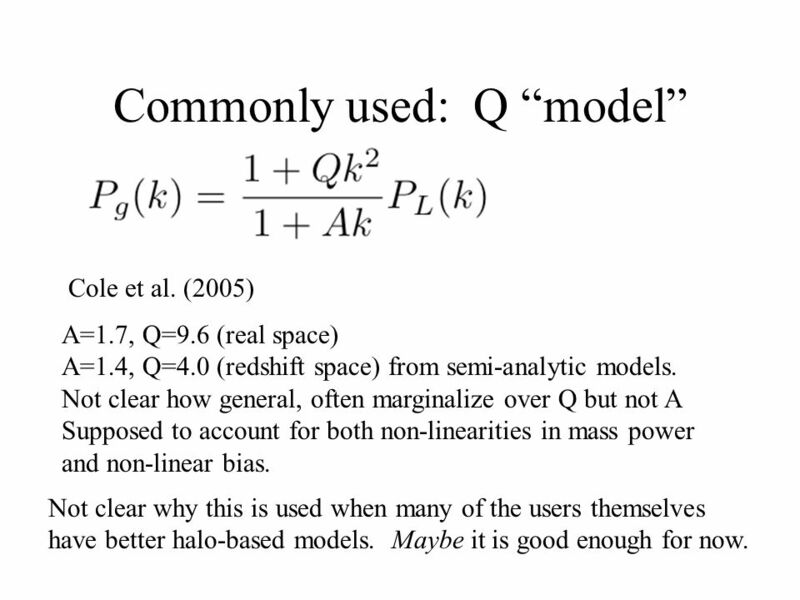 Not clear why this is used when many of the users themselves have better halo-based models. Maybe it is good enough for now. 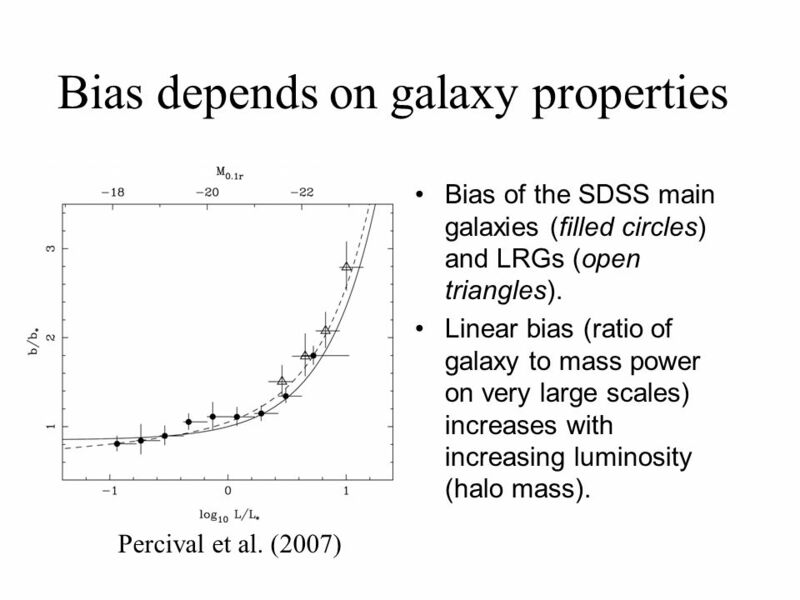 Halo model is a bottom up approach: take one fundamental thing that we know about individual galaxies - they live in dark matter halos - and use this to predict large-scale clustering. There has been a lot of work on this and I’m not saying there’s anything wrong with it. 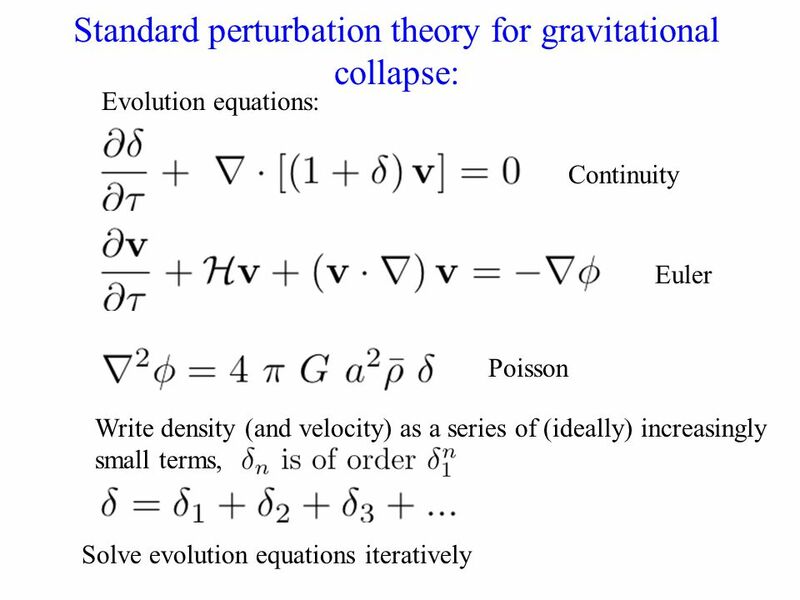 Perturbation theory is a top down approach: start with the fact that perturbations are small on very large scales, suggesting a Taylor series, and sweep small-scale details under the rug as much as possible. Less work so far. It doesn’t work very well. Even to the extent that it does, it doesn’t extend the range of scales accurately predicted very far. 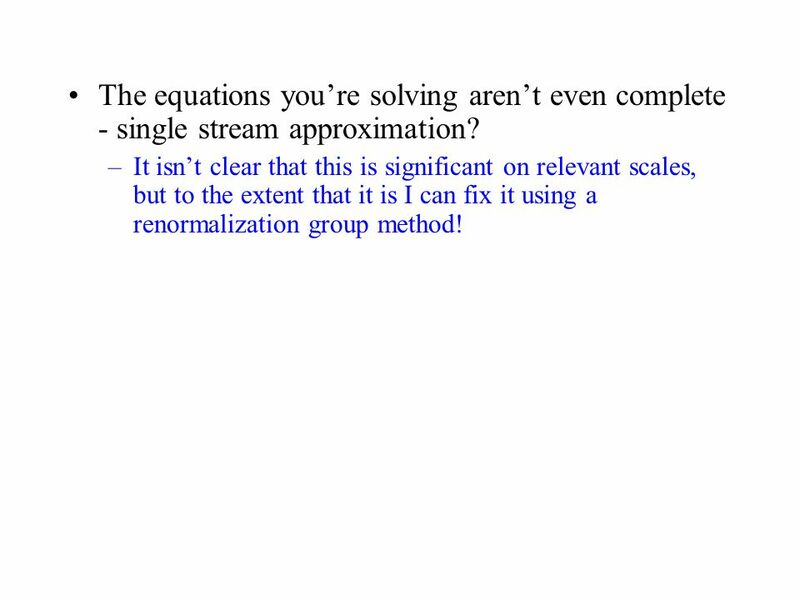 The equations you’re solving aren’t even complete - single-stream approximation. 16 Why I’m working on it anyway: It doesn’t work very well? 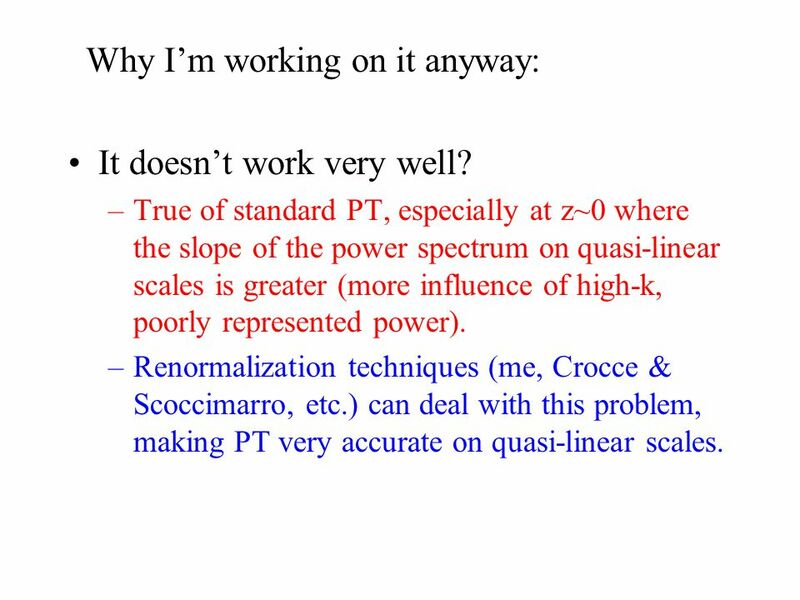 True of standard PT, especially at z~0 where the slope of the power spectrum on quasi-linear scales is greater (more influence of high-k, poorly represented power). Renormalization techniques (me, Crocce & Scoccimarro, etc.) 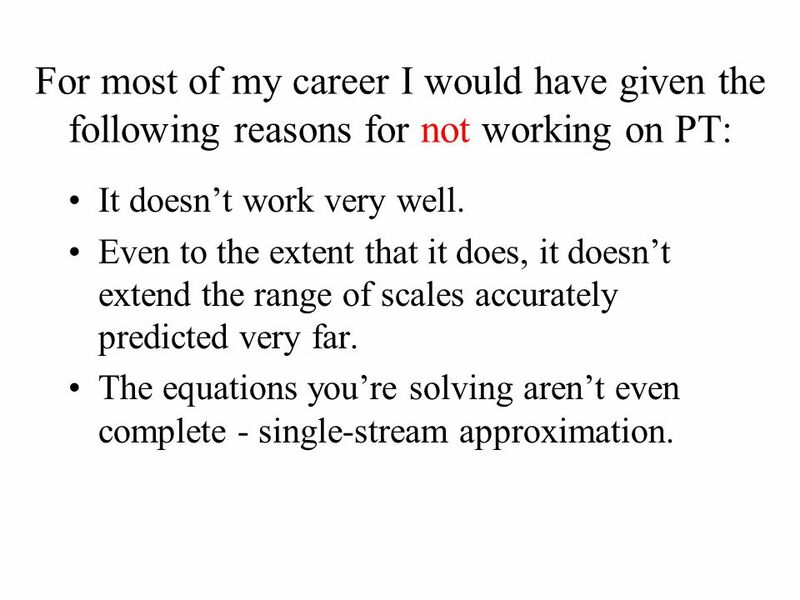 can deal with this problem, making PT very accurate on quasi-linear scales. 17 Even to the extent that it does work, it doesn’t extend the range of scales accurately predicted very far? 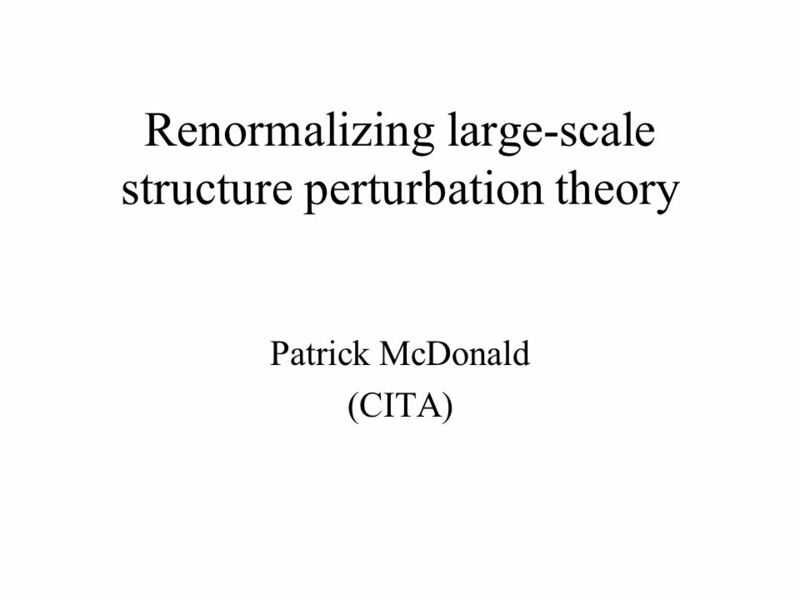 Renormalization helps. 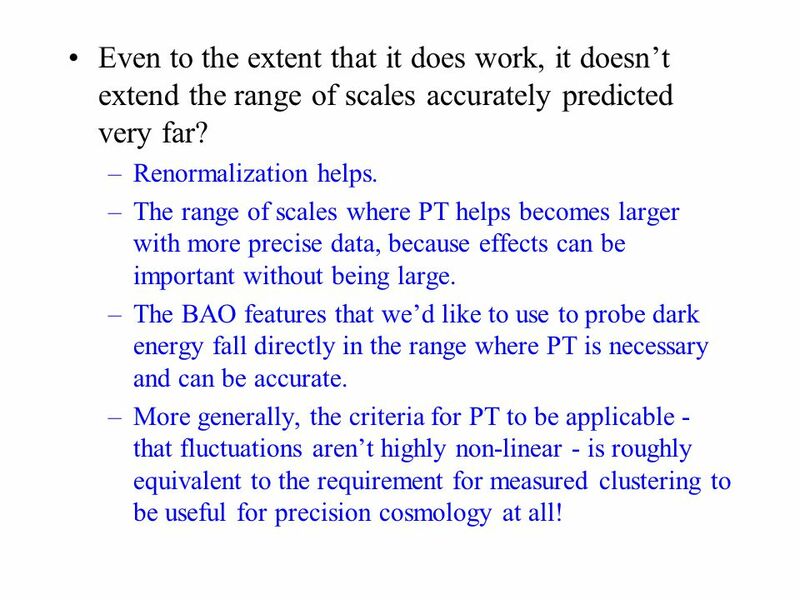 The range of scales where PT helps becomes larger with more precise data, because effects can be important without being large. The BAO features that we’d like to use to probe dark energy fall directly in the range where PT is necessary and can be accurate. 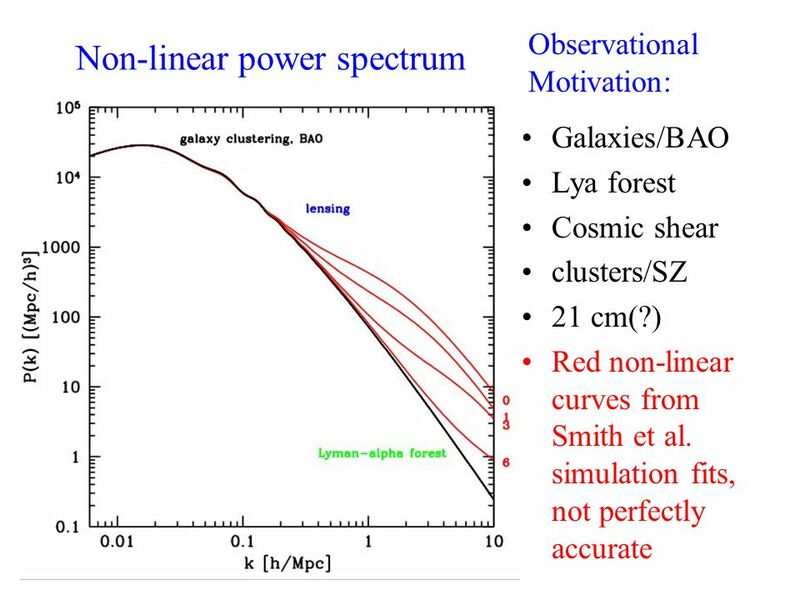 More generally, the criteria for PT to be applicable - that fluctuations aren’t highly non-linear - is roughly equivalent to the requirement for measured clustering to be useful for precision cosmology at all! 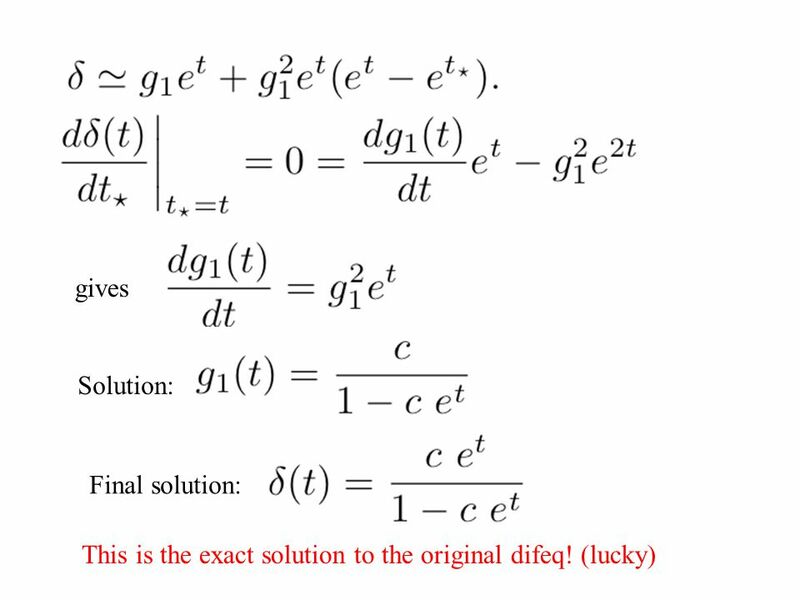 18 The equations you’re solving aren’t even complete - single stream approximation? It isn’t clear that this is significant on relevant scales, but to the extent that it is I can fix it using a renormalization group method! 19 Why not just use simulations? Slow and painful, to the point where no one has pushed through a complete, accurate (well-tested) mass power spectrum result, even though everyone knows it is just a matter of effort to do it. 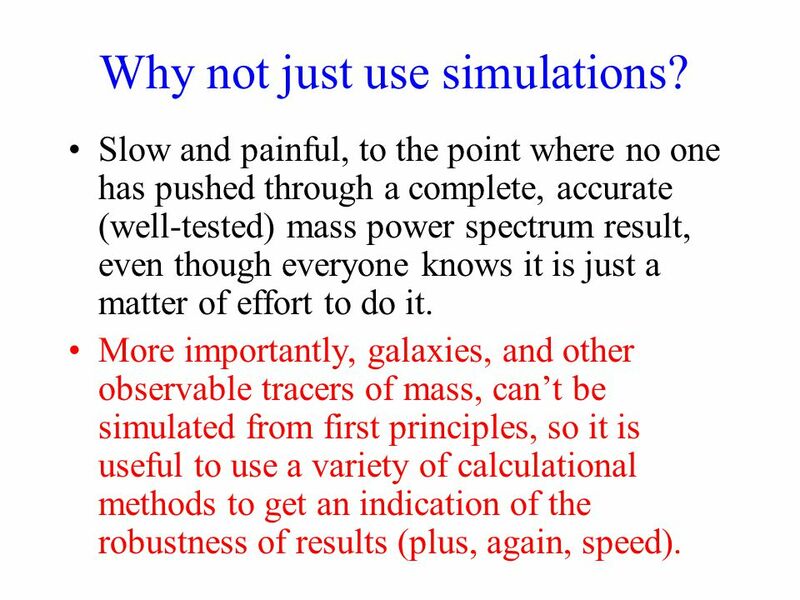 More importantly, galaxies, and other observable tracers of mass, can’t be simulated from first principles, so it is useful to use a variety of calculational methods to get an indication of the robustness of results (plus, again, speed). 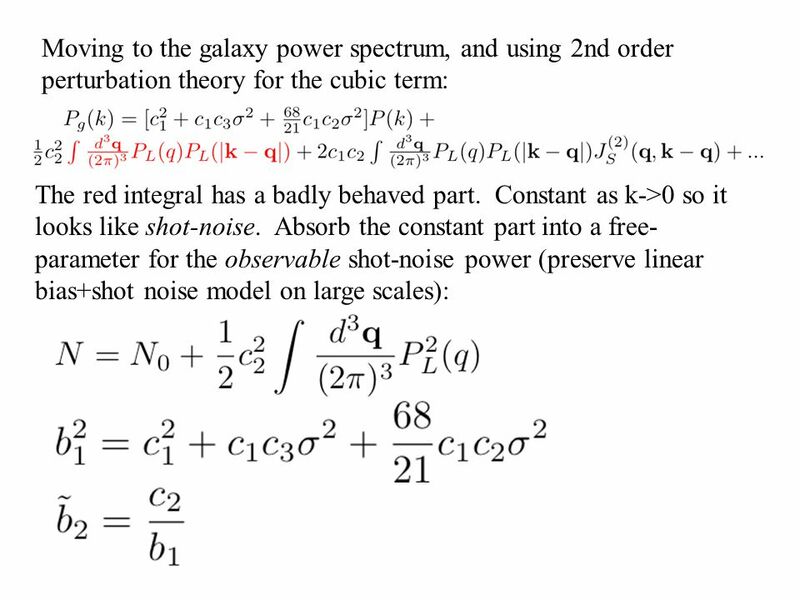 Do cosmological parameter estimation including the galaxy power spectrum using perturbation theory for the bias model. Choose the maximum k in the fits to make sure the results for the two highest orders you can calculate agree with each other. 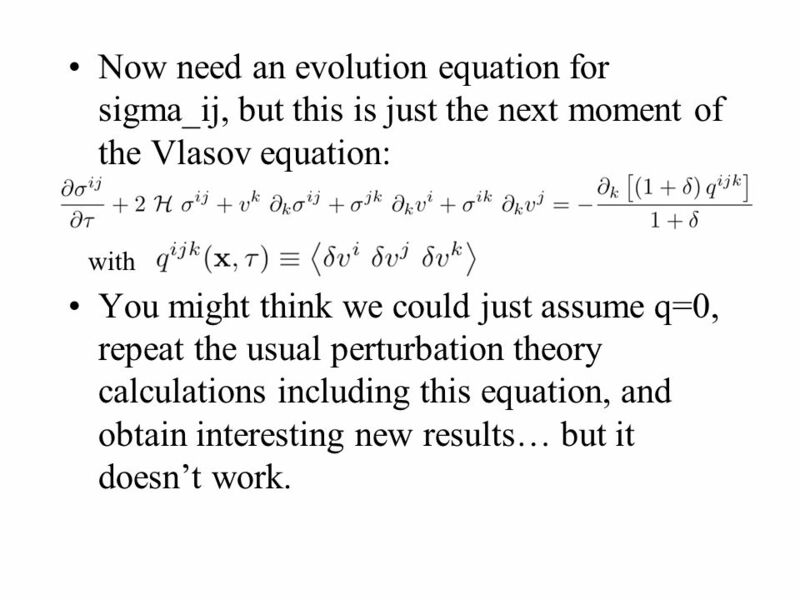 Be convinced that your results must be correct because the perturbation theory covers all possibilities in a well-controlled way. 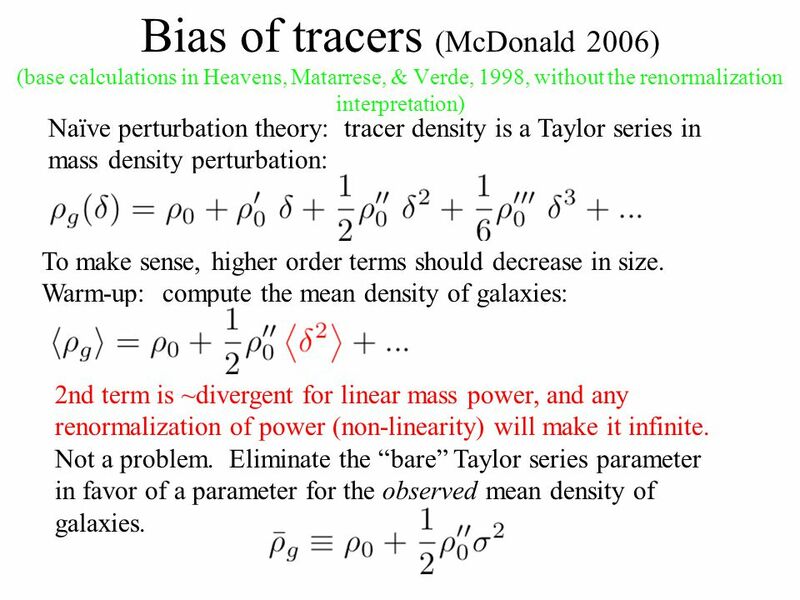 21 Bias of tracers (McDonald 2006) (base calculations in Heavens, Matarrese, & Verde, 1998, without the renormalization interpretation) Naïve perturbation theory: tracer density is a Taylor series in mass density perturbation: To make sense, higher order terms should decrease in size. Warm-up: compute the mean density of galaxies: 2nd term is ~divergent for linear mass power, and any renormalization of power (non-linearity) will make it infinite. Not a problem. 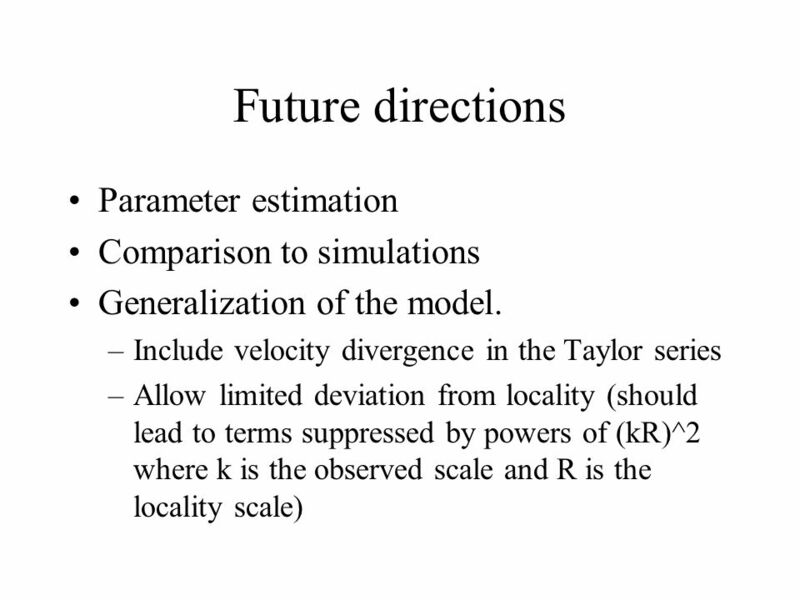 Eliminate the “bare” Taylor series parameter in favor of a parameter for the observed mean density of galaxies. 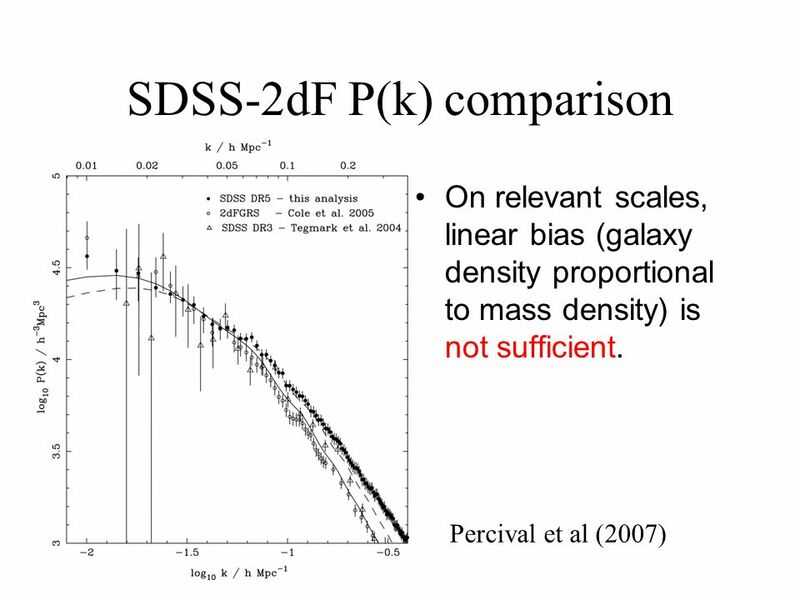 22 The mean density is a trivial example, leads to nothing new. 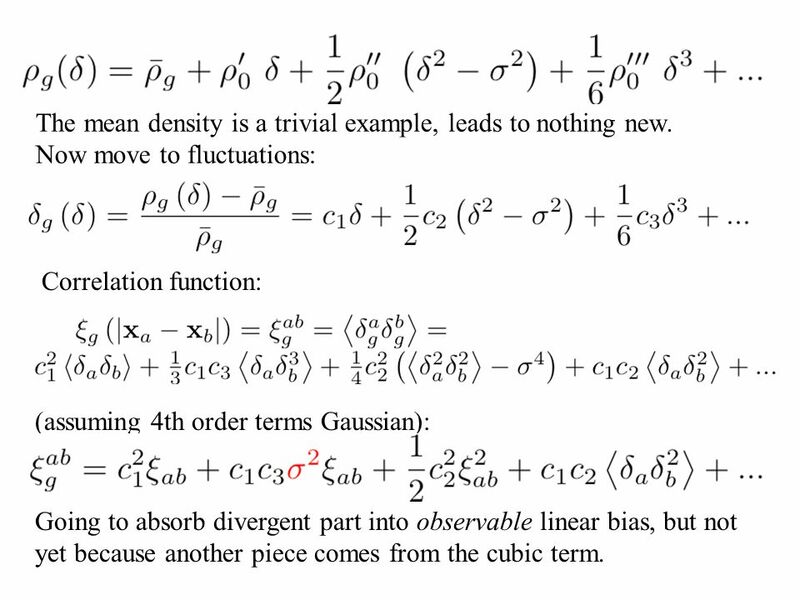 Now move to fluctuations: Correlation function: (assuming 4th order terms Gaussian): Going to absorb divergent part into observable linear bias, but not yet because another piece comes from the cubic term. 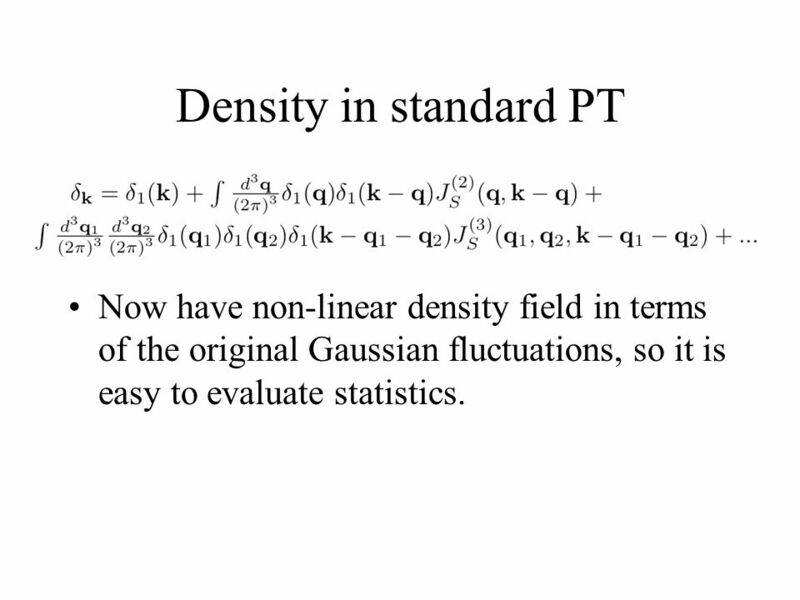 24 Density in standard PT Now have non-linear density field in terms of the original Gaussian fluctuations, so it is easy to evaluate statistics. 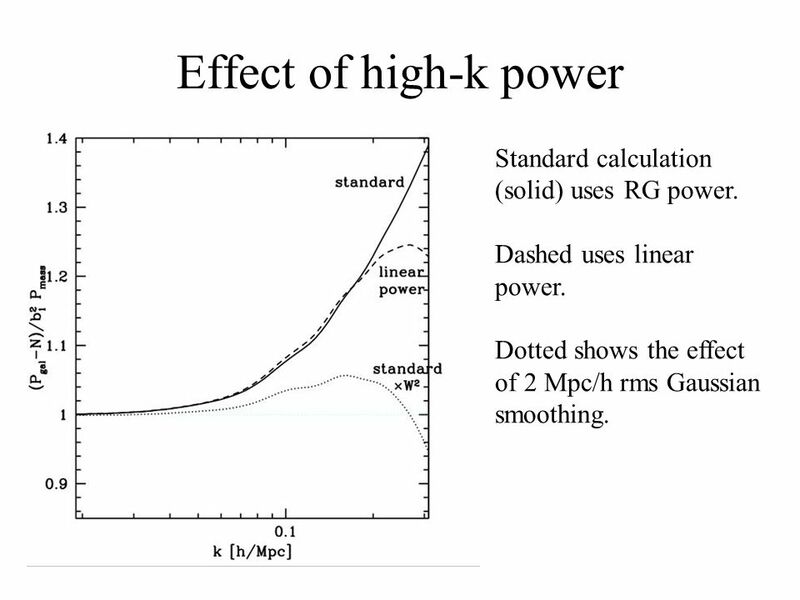 28 Effect of high-k power Standard calculation (solid) uses RG power. Dashed uses linear power. Dotted shows the effect of 2 Mpc/h rms Gaussian smoothing. 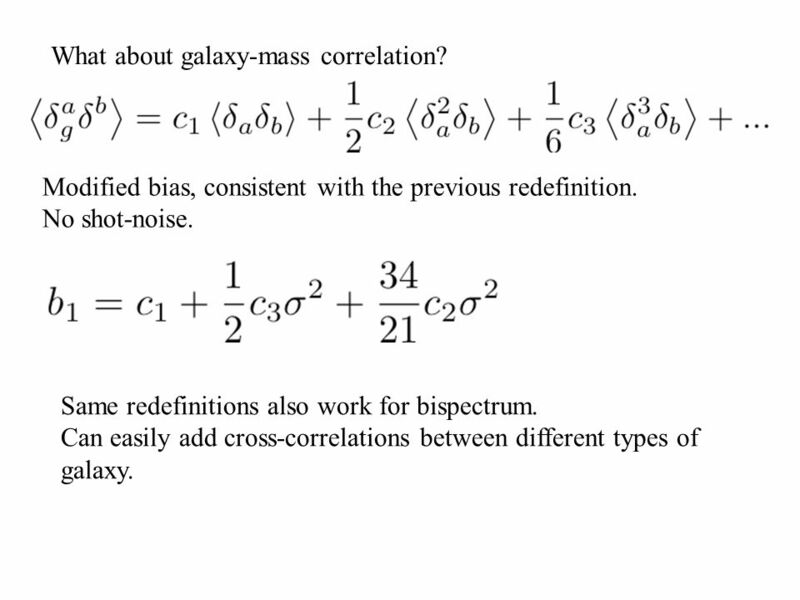 29 What about galaxy-mass correlation? Modified bias, consistent with the previous redefinition. No shot-noise. Same redefinitions also work for bispectrum. 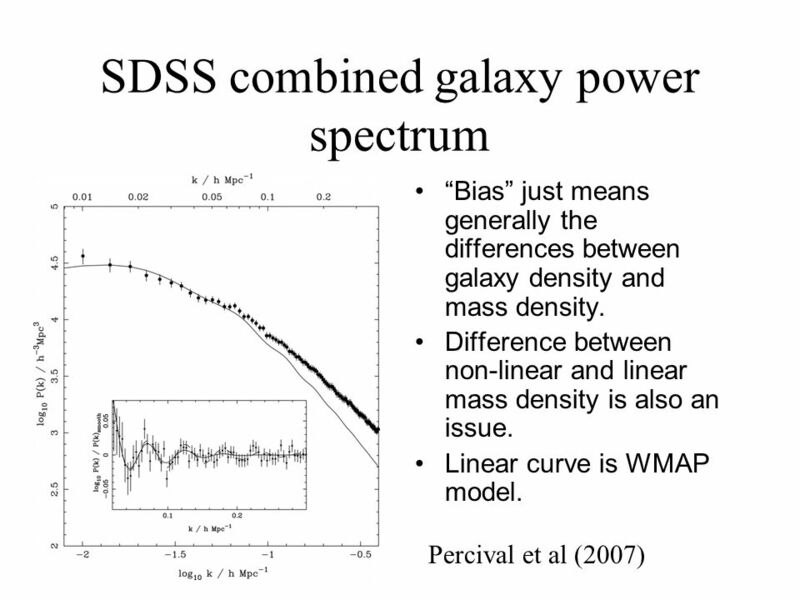 Can easily add cross-correlations between different types of galaxy. 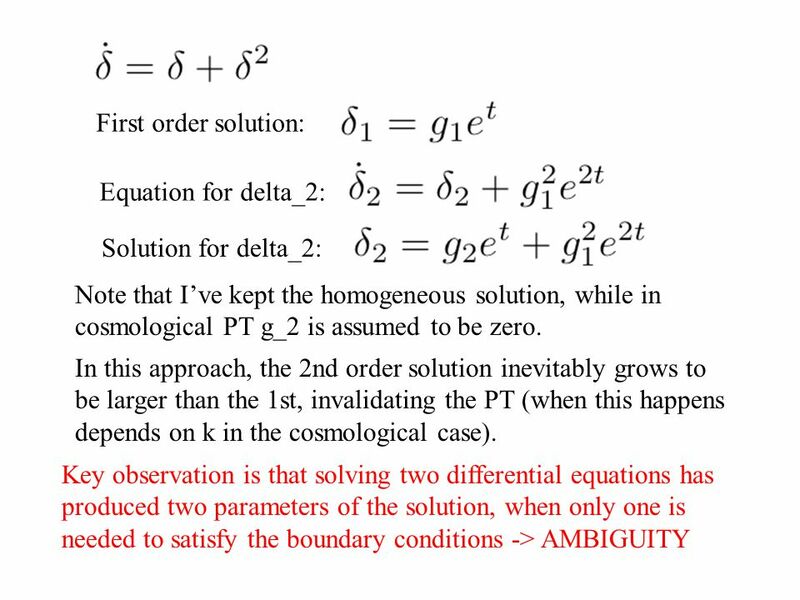 The “single-stream” (hydrodynamic) approximation appears to be a fundamental problem with PT, i.e., the equations we’re solving simply aren’t complete, so even if the result converges, we can’t be confident that it is correct. I’m going to solve this problem, which one might argue is intrinsically interesting beyond the relevance for practical uses of PT to describe observations. 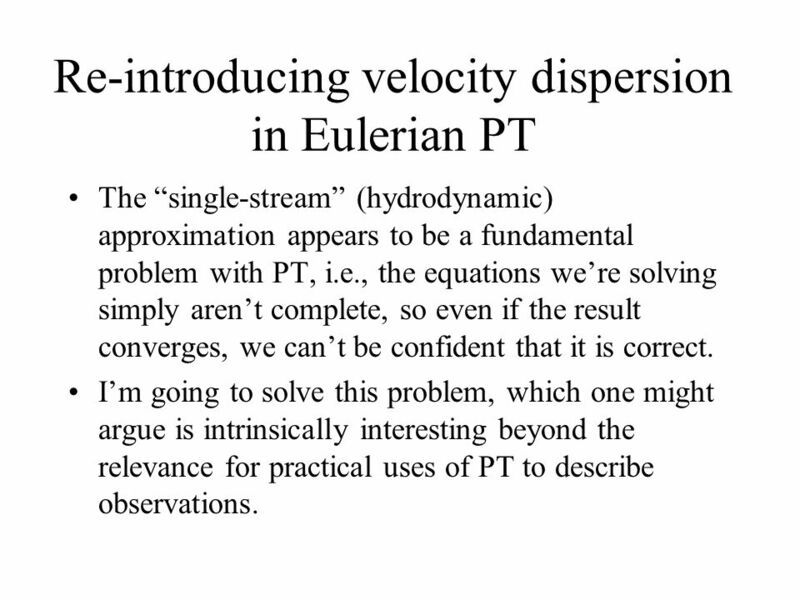 In Eulerian PT, why not just add equations for the velocity dispersion and higher moments? 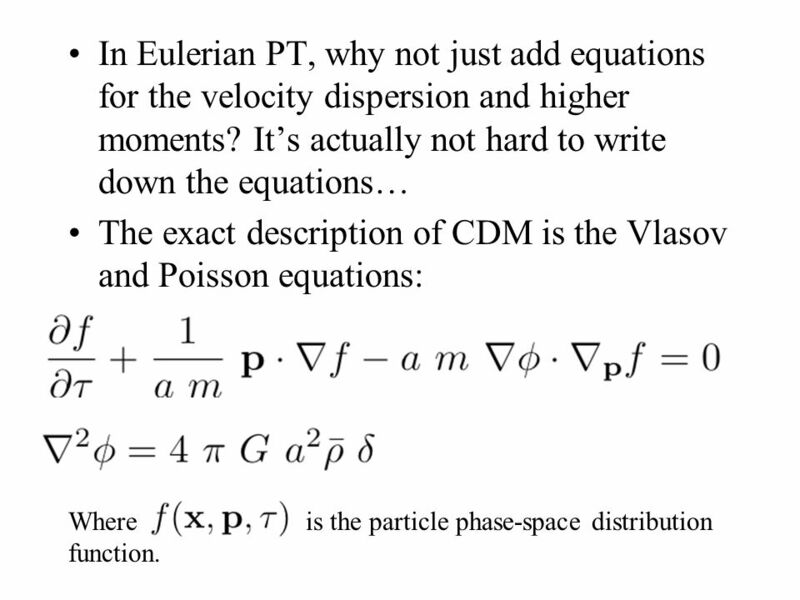 It’s actually not hard to write down the equations… The exact description of CDM is the Vlasov and Poisson equations: Where is the particle phase-space distribution function. 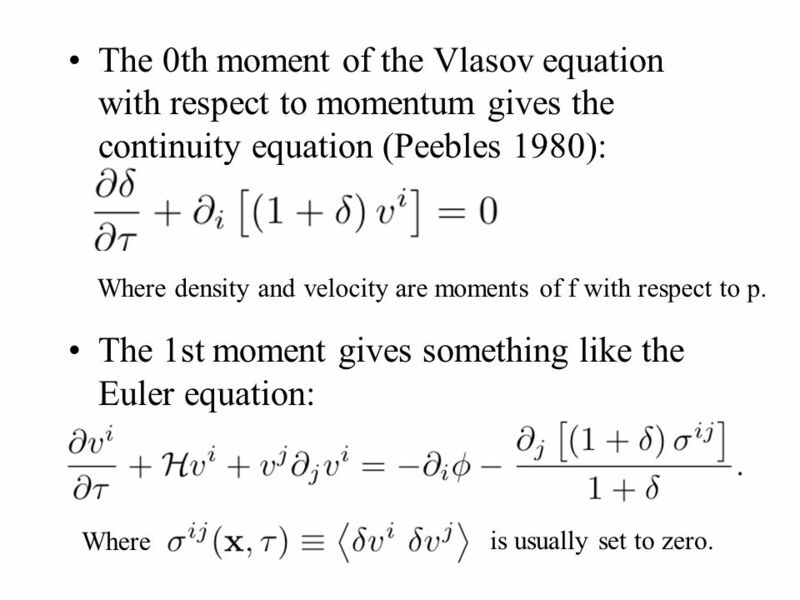 The 0th moment of the Vlasov equation with respect to momentum gives the continuity equation (Peebles 1980): The 1st moment gives something like the Euler equation: Where density and velocity are moments of f with respect to p. Where is usually set to zero. 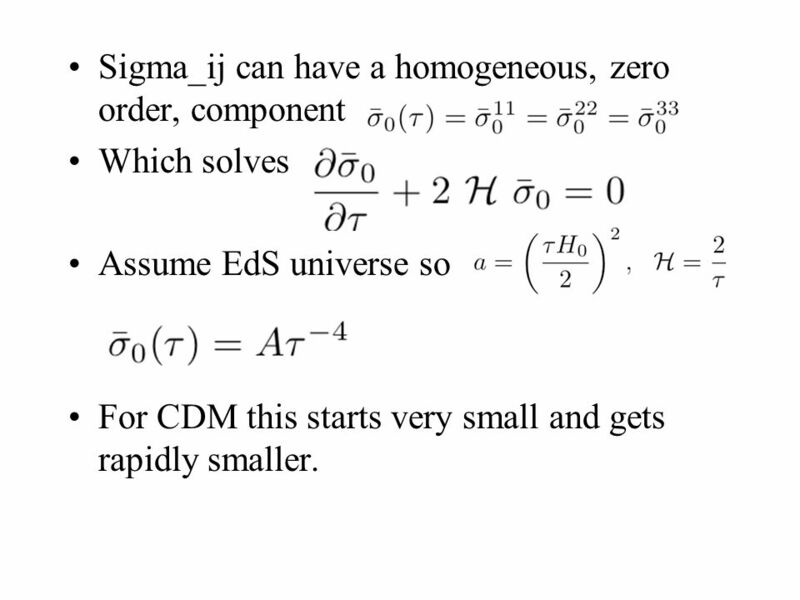 Which solves Assume EdS universe so For CDM this starts very small and gets rapidly smaller. This is the end of the story in standard PT. 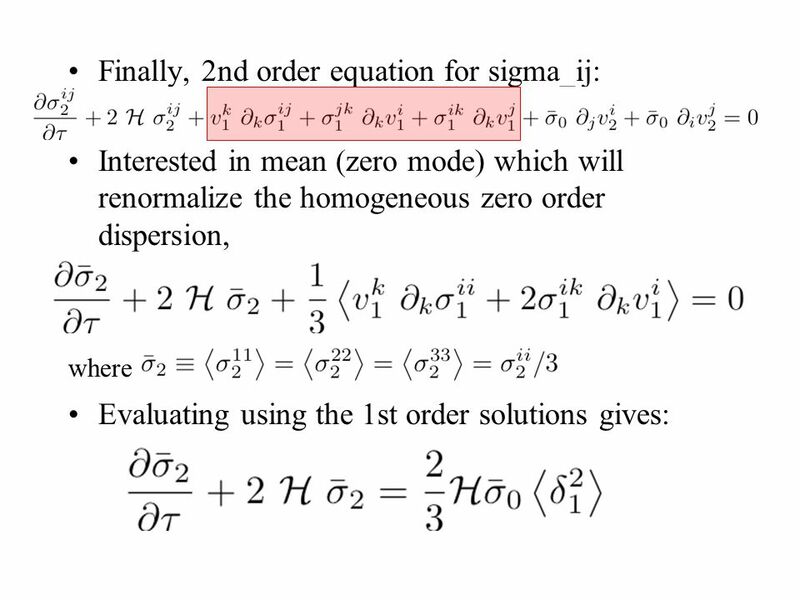 The only source for dispersion is the very tiny zero order dispersion. Vorticity follows a similar story. 43 Very vexing problem! Velocity dispersion, i.e., stream-crossing, is obviously ubiquitous in the real Universe. 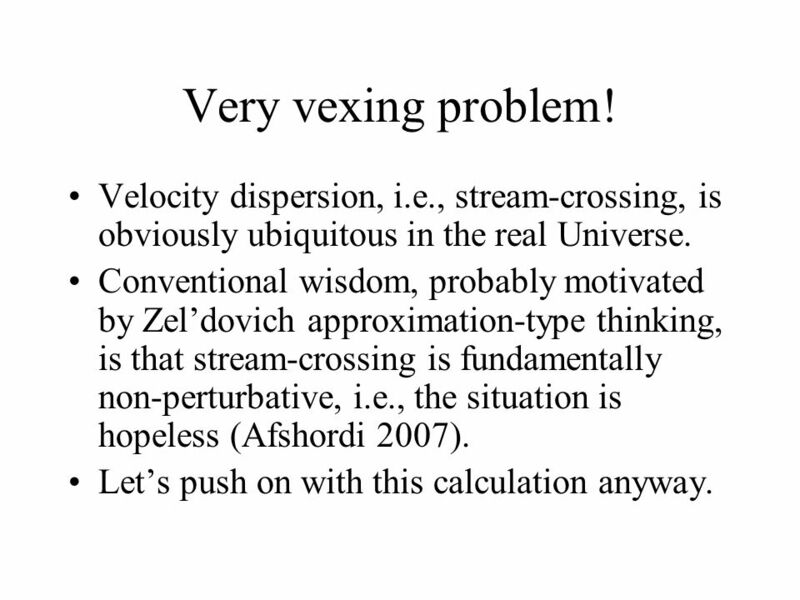 Conventional wisdom, probably motivated by Zel’dovich approximation-type thinking, is that stream-crossing is fundamentally non-perturbative, i.e., the situation is hopeless (Afshordi 2007). 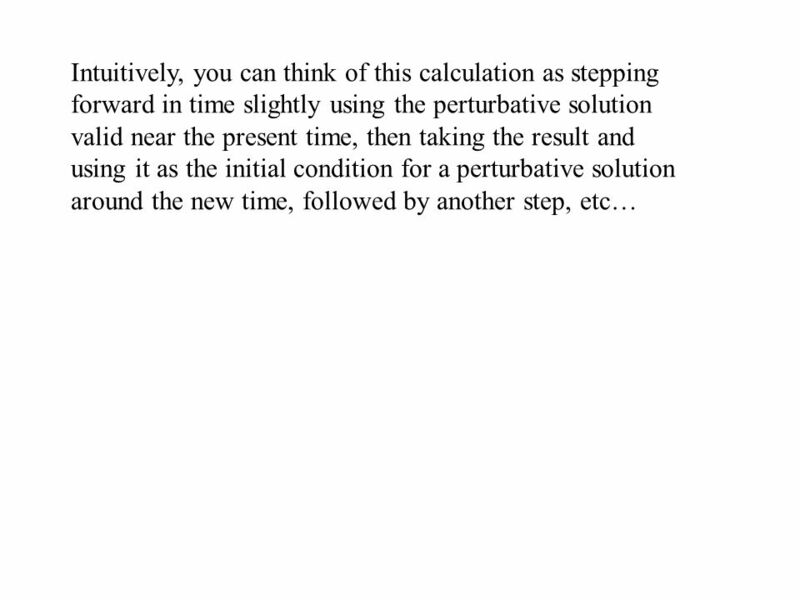 Let’s push on with this calculation anyway. 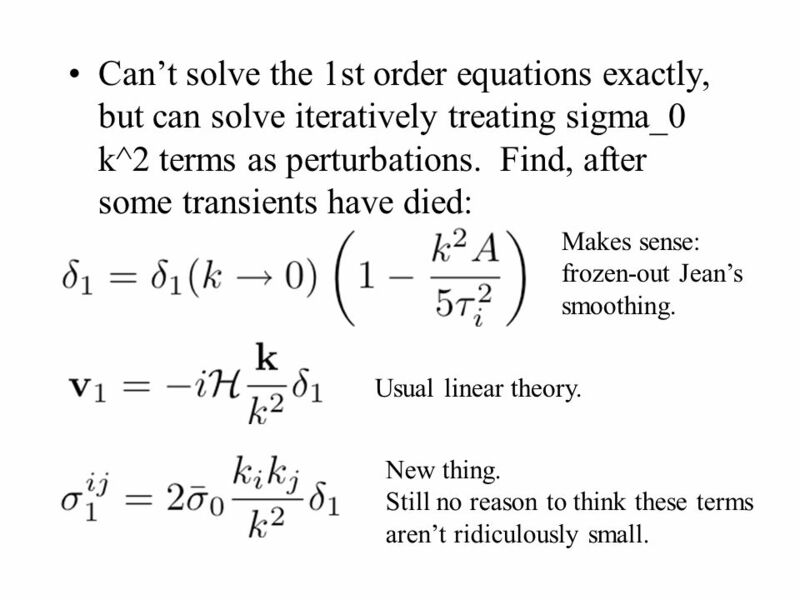 44 Can’t solve the 1st order equations exactly, but can solve iteratively treating sigma_0 k^2 terms as perturbations. Find, after some transients have died: Makes sense: frozen-out Jean’s smoothing. Usual linear theory. New thing. Still no reason to think these terms aren’t ridiculously small. 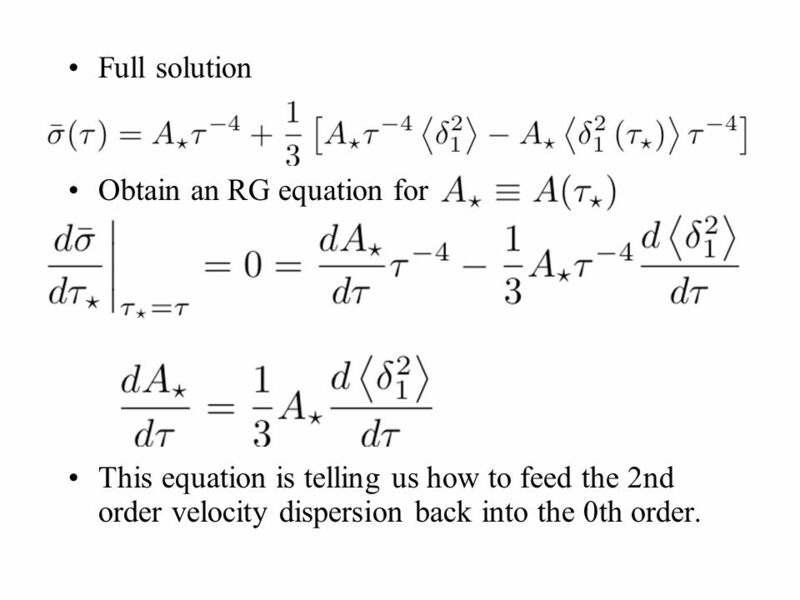 47 Full solution Obtain an RG equation for This equation is telling us how to feed the 2nd order velocity dispersion back into the 0th order. 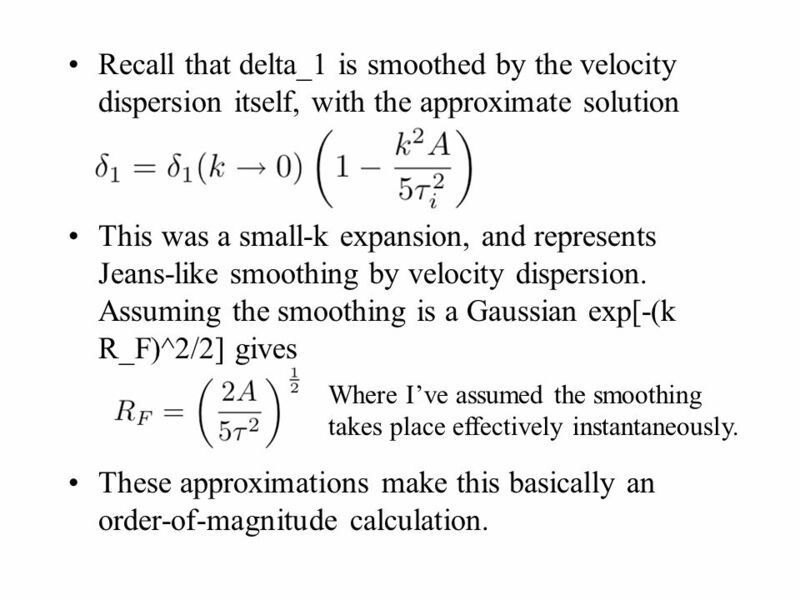 This was a small-k expansion, and represents Jeans-like smoothing by velocity dispersion. Assuming the smoothing is a Gaussian exp[-(k R_F)^2/2] gives These approximations make this basically an order-of-magnitude calculation. Where I’ve assumed the smoothing takes place effectively instantaneously. 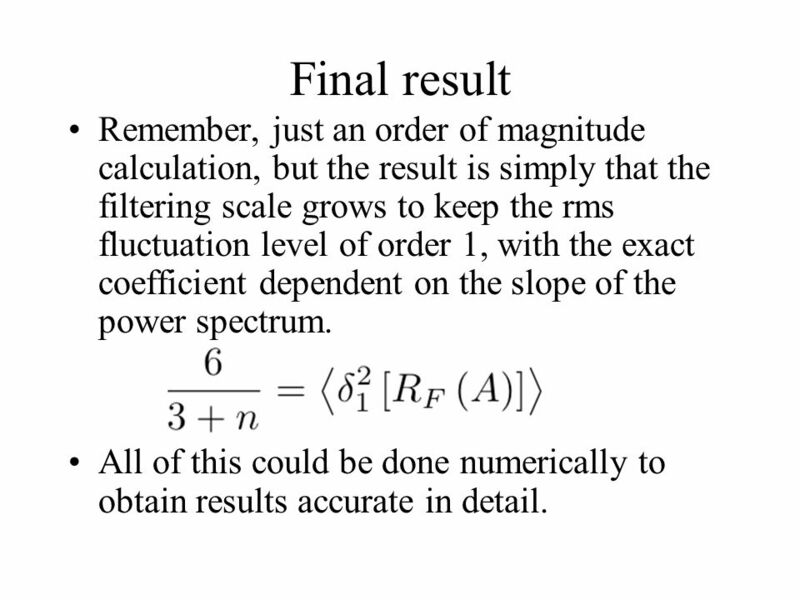 51 Final result Remember, just an order of magnitude calculation, but the result is simply that the filtering scale grows to keep the rms fluctuation level of order 1, with the exact coefficient dependent on the slope of the power spectrum. All of this could be done numerically to obtain results accurate in detail. 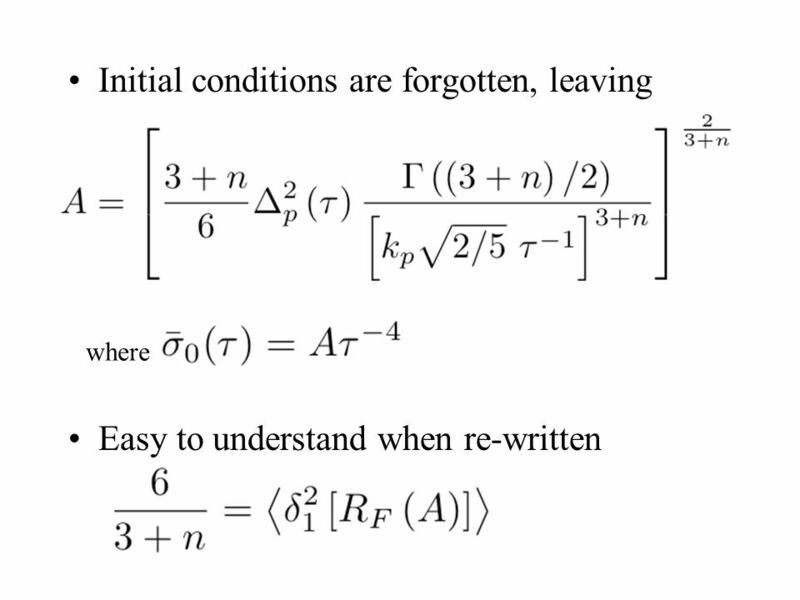 52 The linear power is truncated, but higher order corrections can regenerate it. 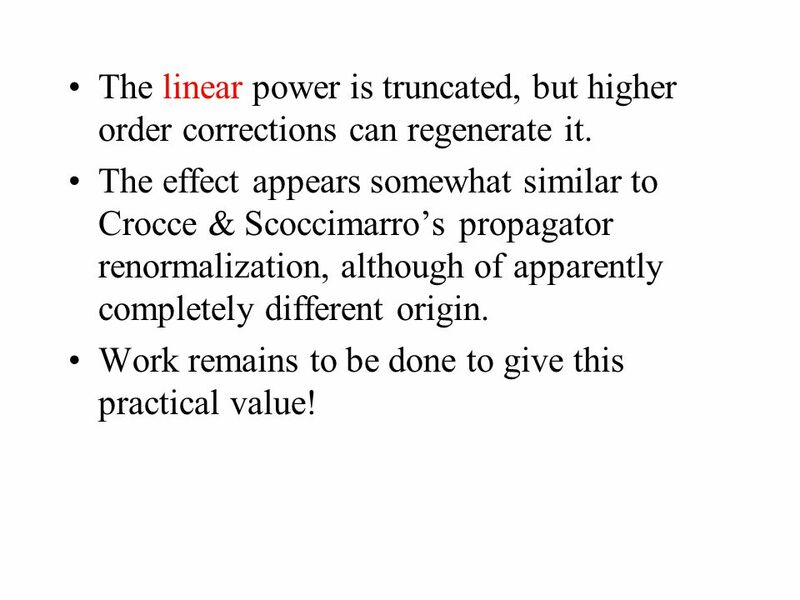 The effect appears somewhat similar to Crocce & Scoccimarro’s propagator renormalization, although of apparently completely different origin. Work remains to be done to give this practical value! 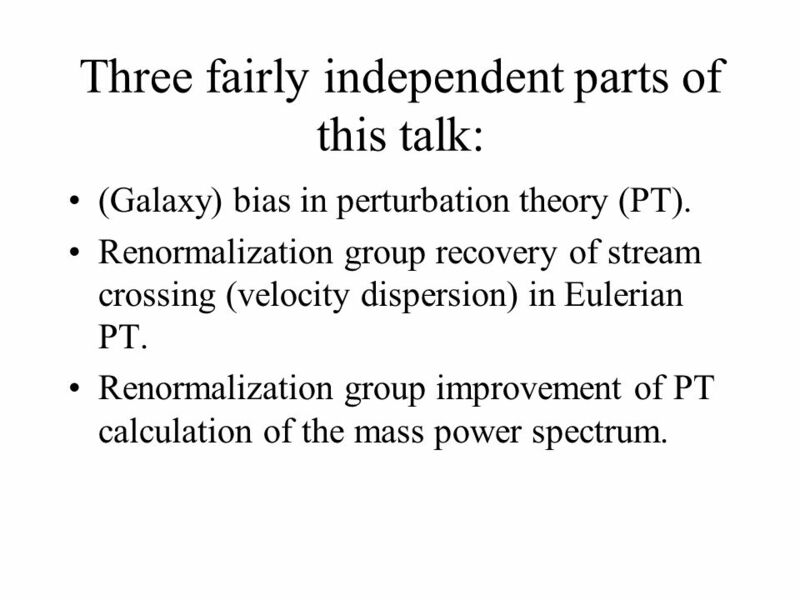 Download ppt "Renormalizing large-scale structure perturbation theory"
Lagrangian Perturbation Theory : 3 rd order solutions for general dark energy models Seokcheon Lee ( ) Korea Institute for Advanced Study ( ) Feb. 12 th. Quantum One: Lecture 6. 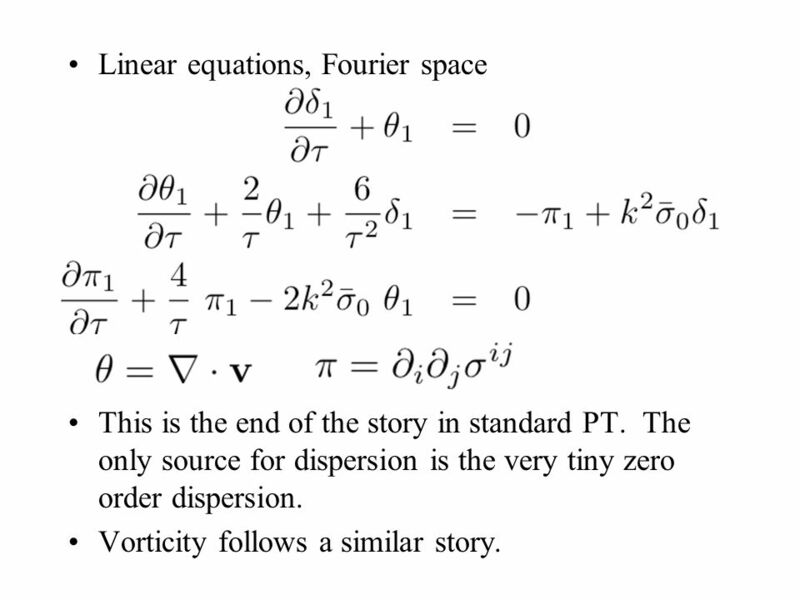 The Initial Value Problem for Free Particles, and the Emergence of Fourier Transforms. Tidal Alignments & Large Scale Structure Christopher Hirata Edinburgh, 22 Jul 2010 C.H., MNRAS 399:1074 (2009) – Redshift space distortions Elisabeth Krause. If the universe were perfectly uniform, then how come the microwave background isn’t uniform? Where did all the structure(galaxies, clusters, etc.) come. 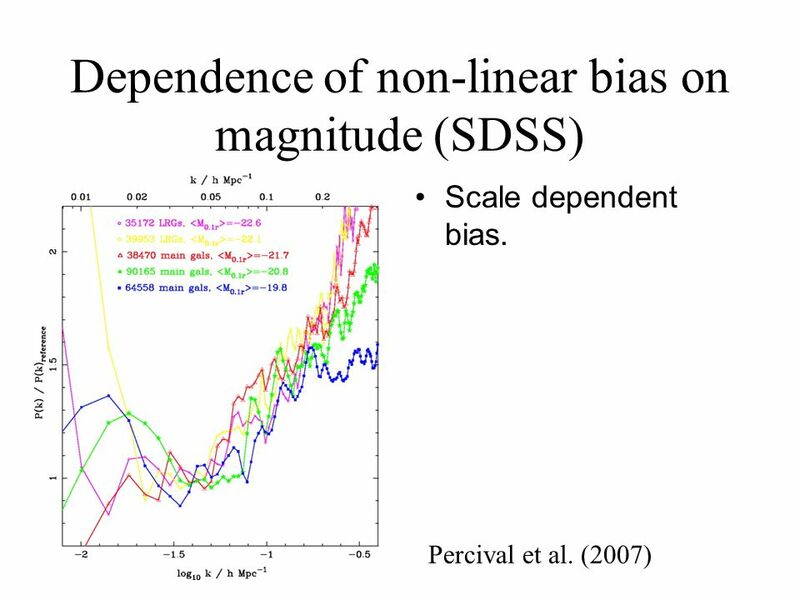 Simulating the joint evolution of quasars, galaxies and their large-scale distribution Springel et al., 2005 Presented by Eve LoCastro October 1, 2009. 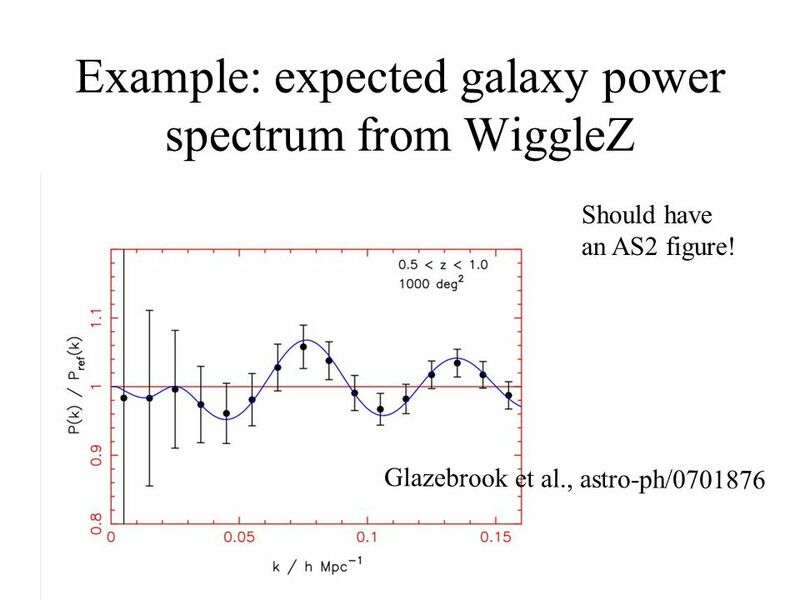 Galaxy and Mass Power Spectra Shaun Cole ICC, University of Durham Main Contributors: Ariel Sanchez (Cordoba) Steve Wilkins (Cambridge) Imperial College. Cosmology Zhaoming Ma July 25, The standard model - not the one you’re thinking  Smooth, expanding universe (big bang). 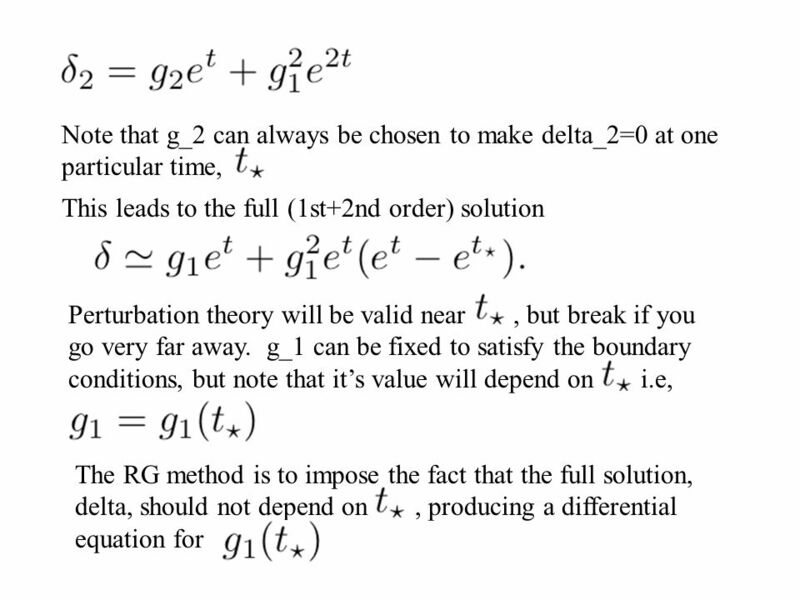  General relativity controls. Measuring the local Universe with peculiar velocities of Type Ia Supernovae MPI, August 2006 Troels Haugbølle Institute for Physics. Setting the rod straight: Baryon Acoustic Oscillations. 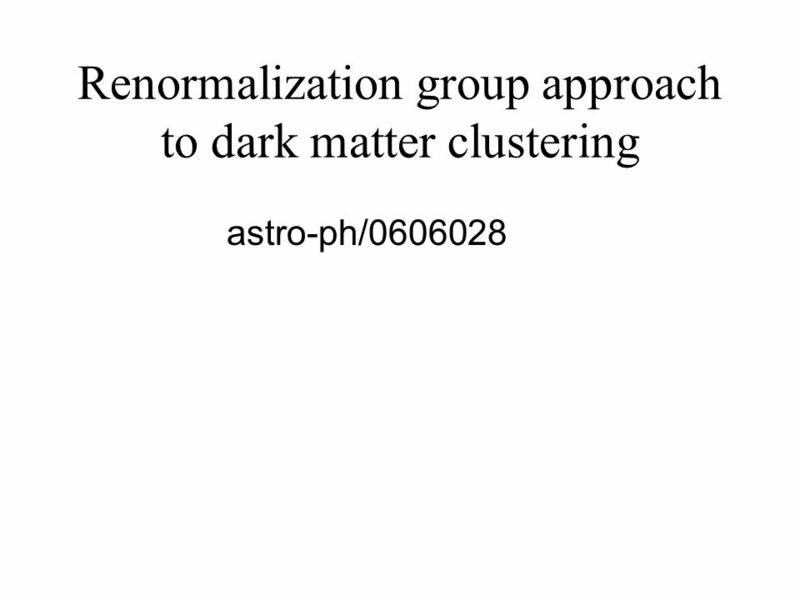 Probing dark matter clustering using the Lyman-  forest Pat McDonald (CITA) COSMO06, Sep. 28, 2006. AP PHYSICS 1 SUMMER PACKET Table of Contents 1.What is Physics? 2.Scientific Method 3.Mathematics and Physics 4.Standards of Measurement 5.Metric System.